Plank cooking has been around since the beginning of time, well as long as us humans have been around anyway. In America it is thought to have originated with native Americans who used the plank as a way of securing their food to a clean surface for cooking around the campfire. I first experienced a similar style of cooking in Finland where it is called "loimulohi" or "blazing salmon". 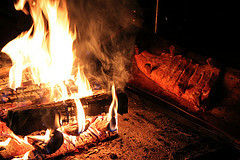 Here a side of salmon is staked to a wooden plank and propped up beside the camp fire. In this style of cooking the heat only needs to be small and the salmon cooked gently, if cooked too fast it will break up. When I saw it done, the salmon was cooking by a camp fire in the snow for about 90 minutes. 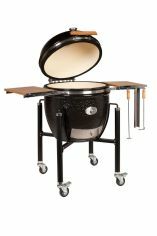 Thanks to those inventive guys at Monolith, this style of cooking may be coming to your kamado very soon! 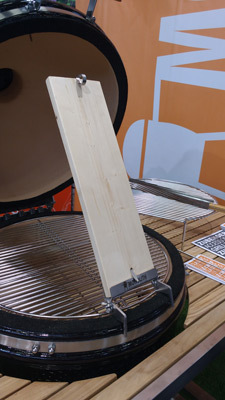 For a modern day barbecue enthusiast what’s so great about plank cooking? The principle is that the taste of the wood (usually Cedar or Alder) is absorbed by the food during the cooking process. I have to say that when I first started cooking with planks I wasn't convinced but now I'm a convert. Your food comes out supremely moist (especially fish) and it also makes for a memorable cooking event. Barbecuing with planks needs a barbecue with a lid because you need indirect heat because the objective is to heat up the plank rather than burn it (like a grill would do). Soaked the cooking plank for an hour to allow it to absorb moisture then place it in the grill / smoker to warm up (using indirect heat) and then the fish is placed on the plank. 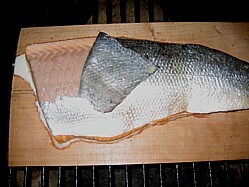 TIP 1 - Make sure the skin is left on the fish and place the fish on the soaked cooking plank skin side down. 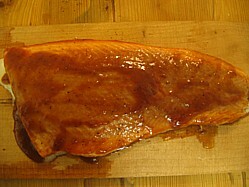 When you put the plank over the heat, the moisture in the plank (together with the plank flavor) starts to steam the fish. The impermeable skin of the fish acts like a lid and keeps the moisture and flavor all packed up inside the fish. Cooking is done at a low temperature (120°C or 240°F)and I prefer to do it without the addition of wood chips. A fillet of fish will normally take between 20 and 30 minutes to cook. TIP 2 - When you think your fish is ready try peeling back the skin. If the skin comes away easily then the fish is done. When the skin comes away, season with salt and pepper and you're ready to serve. Planked Hamburgers - slow cooked to a succulent perfection! Pheasant Breast - with fresh basil all wrapped up in a rasher of back bacon. Cedar Plank Grilling White Fish - works with any white fish and is simple to prepare. Wash planks in warm soapy water, don't be tempted to put them in the dishwasher. Store your planks in a brown paper bag so that they can breathe. If you store in a plastic bag you my get mold growth. I have had the occasion to cook on planks when I have no immediate access to water to soak them. Soak them before you leave home, wrap them tightly in cling film and they will stay moist for a few hours. Not all planks are the same, some of the cheaper ones can be so thin that they break and last less than one cookout. Spend only a little more and you'll get planks that can be used multiple times. I've found these ones from Amazon to be more than acceptable.